This post details my process for blending together a series of aged sour beers. In 2013 I brewed a good number of turbid mashed sour beers which were fermented with dregs and/or commercial mixed cultures. I had brewed sour/funky beers before these, but these were my first serious directed brews in the direction of what I consider to be the best commercial beers out there. These sorts of beers benefit greatly from blending - taking advantage of the different directions each beer went to create a more complex and balanced final product. My brewing of these beers was aided by moving temporarily to Germany for 8 months, giving plenty of time for these beers to age and fully develop. Leading up to my move I knew that I wouldn't be able to bottle and drink beers that I was brewing but I wanted to keep brewing. So I shifted focus toward long aging beers that I could brew before I left and leave in carboys while I was away. And I have a great friend here in Victoria who was willing to house the carboys (I think about 8 in total) in his basement and check on them to make sure the airlocks didn't go dry. This allowed me to continue brewing before my trip and let me (temporarily) forget that I had these beers aging so I gave them enough time to develop. All together I had 5 sour blond beers between 20 and 27 months old to blend together into final products. This is a pretty long post, but perhaps that is fitting for beers that took ~2 years to produce and that still have a few months (hopefully not more) until they are ready. I'll present some of my thinking process for production unaltered from my notes. It wasn't a perfect run through but I think it was pretty good for my first go at it and there are things I would do differently next time. These beers were heavily influenced by Belgian lambics - spontaneously fermented complex acidic beers from the Senne valley of Belgium. Four of the five brews were turbid mashed with a high component of unmalted grain, generally wheat (the fifth brew had ~15% flaked grains). Four of the five had aged hops and were 'coolshipped', or cooled by leaving them open outside overnight. Many brewers, both homebrewers and commercial brewers, apply to term lambic to beers such as these. And there is some debate in the brewing community about whether or not it is fair to use this term. Based on my not calling these beers lambics up to this point, perhaps it is clear that I fall on the 'not using the term lambic for my own beer' side. Many of the best brewers of North American spontaneous beer (De Garde, Russian River, Allagash, etc.) don't apply to term Lambic to their own beer. Some of these brewers are on record saying they choose not to do this out of respect for the Belgian producers whom they hold in high regard. In addition, I more frequently see the term lambic applied to non-spontaneous commercial beers (fermented with pure purchased yeast cultures and blends) when those brewers seem to have less understanding, and possibly less respect, for Belgian lambic. This is certainly not a rule but it is a correlation, and personally I am less likely to buy a North American made beer calling itself a lambic than one calling itself a spontaneously fermented beer. At least in the latter I know what I am getting and it is not fermented with pitched microbes from a lab. Regardless of which side you are on for the debate on whether the term lambic can be applied to non-Belgian beers, I think my beers discussed here are clearly not lambic for one main reason: they are not spontaneously fermented. I did pitch microbes into these beers. Sometimes it was dregs from commercial sour beers (both spontaneously fermented and pitched) and sometimes it was pure yeast cultures or blends from yeast labs. All of these five beers were open cooled and in some cases I waited an extra day or two to pitch cultures/dregs into the beers, so hopefully I got some contribution from ambient microbes. But whatever the case they are non-spontaneous beers and therefore, whether or not using the term lambic for beers made outside of Belgium is appropriate, these are not lambics. Alright, sorry that was a bit of a long tangent. It is something that I my thoughts are developing on, especially after beginning friendships with some of the Belgian lambic producers. I get frustrated by seeing breweries around me and across the US and Canada throw the term around to mean sour beer so I feel I ought to make the distinction clear between these beers and lambics. For many of these my process was pretty similar. I suppose this is because they were brewed at roughly the same time and I didn't have beers of this sort ready to drink in between these brews so I couldn't really examine my methods with results. Most of the time the unmalted wheat is red wheat and the turbid mash process is the Cantillon-esque one outlined in Wild Brews by Jeff Sparrow. The dregs are generally from cultures I grew rather than straight from the bottle and I proofed the cultures for off aroma (and sometimes flavor if I felt they were fermented enough) before adding them. The biggest thing I'd change about the brew day and microbes would be not using WLP644 (it was new and exciting then), but I'm happy with the results so I suppose it couldn't have been too big of a deal. I was pretty careful to keep O2 out after primary fermentation was done (excepting the oak thing discussed below), so anytime the carboys were opened to add dregs, take samples, or top up after the main fermentation I purged the headspace with CO2. Muse #1 - Brewed 5-January-2013. 40% local unmalted wheat, 60% 2-row. 0.89 oz/gal (6.66 g/l) aged hops, open cooled, pitched with a bunch of spontaneous beer dregs (2 different 3 Fonteinen geuzes, Tilquin gueuze, Boon Marriage Parfait, Cantillon gueuze and Rose de Gambrinus) and WLP 644. After a couple of months when visible activity was done I swapped the airlock for an oak rod fit inside a stopper. I used white oak, which allows more gas transfer than red oak. This is another thing I'd change (I wouldn't do it at all). This beer got a bit acetic. Not aggressively so but a bit more than my taste preference. That may have been from the white oak (or oak in general), it may have been from this being the oldest beer and I might have fussed with it more, or it might be unrelated to those. Anyway, I think the oak stopper idea isn't necessary or even possibly beneficial (and the general community seems to have moved away from this method as well). I swapped the rod back for an airlock after 6 months. This was topped up after about 6-7 months and transferred to my friend's basement for storage. Sour Saison - Brewed 17-February-2013. This is the only non-turbid mashed brew of the bunch. This beer came out of a big brew day with my local homebrewing club BrewVIC. I didn't want to worry about sanitation when I was brewing somewhere else without access to all the things I usually have so I went with a purposely sour beer. The recipe was 65.1% Pils, 14.5% Flaked Triticale, 9.6% Vienna malt, 7.2% Munich malt, 3.6% Acidulated malt. It was hopped with Hallertauer Mittlefrueh and Saaz to 27 IBU with first wort and flame out additions. I open cooled the beer and, along with Wyeast 3724 and WLP644 Trois, I pitched commercial dregs (Brasserie a Vapeur, Upright, and Cantillon). At ~ 5 months it was topped up with unpitched saison wort and a bottle of saison and transferred to my friend's basement. Saambic - Brewed 30-March-2013. This was my first attempt toward focusing on local terroir, but I did end up pitching microbes into it so actual terroir will have to wait for a future brew (which has already happened but is much to young at this point). It had 40% local unmalted wheat, 60% locally grown and malted barley and 0.45 oz/gal (3.4 g/l) locally grown aged hops. 2 days after brew day I pitched an ambient microbe starter made from leaving wort outside to spontaneously ferment (see this post from the Mad Fermentationist), dregs from Boon Marriage Parfait, 2 different 3 Fonteinen Geuzes, Cantillon Gueuze and a homebrew Russian River Sanctification clone from my friend Dylan. At 4 months it was topped up with unpitched wort from a saison brew and transferred to Mark's basement. Wild Rye - Brewed 28-July-2013. 39.5% local unmalted rye, 60.5% Franco-Belges Pils malt, turbid mashed. 0.5 oz/gal (3.75 g/L) aged hops. This beer was open cooled and pitched with 2 ambient microbe starters and WLP 644 Trois the morning after brewing. About a week and a half later it was transferred from a 6 to a 5 gal carboy and topped up with more from the ambient starters and the trois along with dregs from 2 different 3 Fonteinen geuzes and some ECY01 starter. Two weeks after that it was topped up with ~150 mL of dregs starters from Brasserie a Vapeur, Upright, and Logsdon Cerasus. A week later it was moved to my friends temp stable cool basement and topped up to the neck with ~1.4 L of homebrew saison. ECY-01 - Brewed 24-August-2013. 39% local unmalted wheat, 2% Acidulated malt, 59% European pils malt, turbid mashed, aged hops (~5.7 g/L, 0.75 oz/gal). This beer was cooled open outside and was pitched with ECY-01, an ambient spontaneous starter, 3 Fonteinen Oude Geuze dregs and a small amount of WLP644 Trois 2 days after brew day. Two weeks later, after primary fermentation was done, it was topped up to the neck with a starter saved from extra wort from this brew along with some more dregs (3 Fonteinen, Cantillon) and more spontaneous starter as well as a bottle of homebrew saison. After this the beer was transported to a basement with exposed rock which stays stable and appropriately cool year round. In general, as with above, I focused on getting the right acidity (by taste) with sufficiently low to below threshold acetic acid, and also appropriate flavor complexity balancing the fruitier/more citrus-forward beers with funkier/more earthy beers). I kept proportions fairly simple (1/2, 1/3, or 1/4) didn't try to involve more than 3 beers. I either based the blend on one of those two or three or did even splits. I started mostly by working with slightly more complex (three beer) blends and by seeing what proportions of the more acetic beer, which otherwise had nice flavor, were good before the acetic became too prominent. This was valuable but I then moved toward simplifying by focusing on my favorite individual beers and seeing how they complimented each other, and this is likely where I would start next timer After a couple blends working only with the four turbid mashed beers, I remembered that I had this sour saison around that was of similar age and had similar added microbes. Throwing that in the mix helped by providing another good tasting and cleaner beer for blending. WLP644 beer for lowering acid in the fruit blend. Once I had determined my favorite blends, I looked at what I wasn't using so much and thought about blends involving those that might be good for fruit (following the lead of lambic production - a lambic blender is not going to put fruit into their best lambics as this would cover up the complexities of the lambic). These less favorite beers weren't bad and they didn't have any big red-flag flaws (strong acetic or ethyl acetate, strong 'mousy' character, etc.) so I figured they would be a good candidate for fruit. Fruit is expensive and adding fruit is not going to remove a strong off character so I would not advise using fruit to cover up flawed beer. It will, however, work nicely with a good but perhaps not as complex/expressive beer since the fruit flavor is going to overwhelm many of the more minor complexities in the base anyway. I did the blending for tastes by weight by pouring samples into a glass on a scale (0.01 g precision). This allowed me rather precise blend ratios and the ability to try a greater number of different blends but made sample sizes smaller than if I had blended with a graduated cylinder. For just doing this by myself, the weight approach worked out rather well. But if I were to do this with other people I might go with the cylinder approach. If I felt that a blend would be better with the ratios slightly tweaked, I didn't re-blend into my partially consumed taste sample. Doing this would have made determining the ratios very difficult to impossible. Instead I just did a completely new blend. 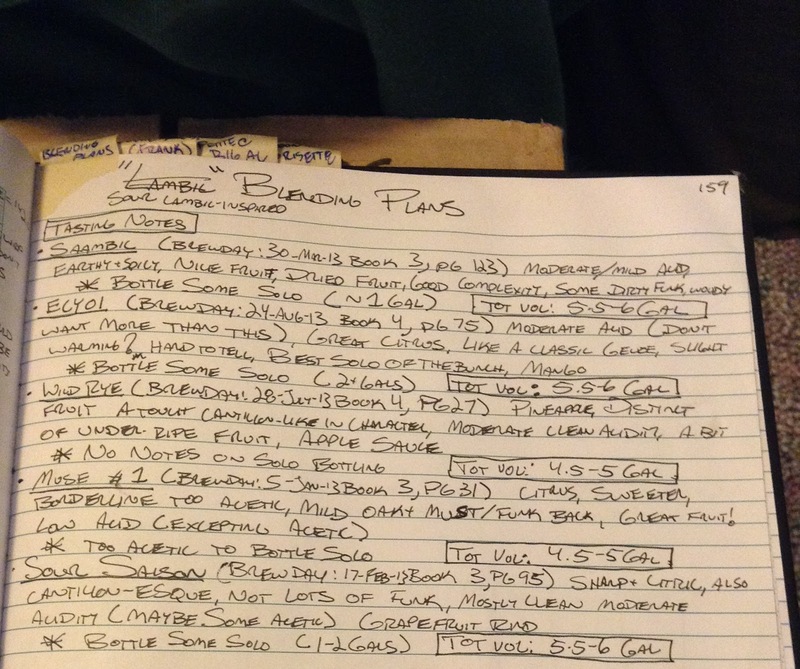 After determining the blends I wanted to do, I thought about the volumes of beer I had and the carboy sizes I had. I wasn't sure when I would be able to bottle and I didn't want to leave a bunch of head space in a half full carboy of a blend that I was waiting to bottle. I made an excel sheet for this based on the blend ratio that I chose and giving larger volume preference to the blends I liked more to fully use the beer I had either in a blend, bottling some plain, or racking some to a new carboy. This part was a bit tricky and it took some playing with to get everything to work out right, but basically I put my starting volumes of each beer at top and then put my blends in, subtracting what I was planning to use for each blend And I adjusted my blend volumes while keeping the ratios so that in the end I used all of each batch and got blends or single-beer transfers of roughly full carboys, with plans to bottle a left over gallon here and there. Once that part was done I re-arranged the blends so that I could rack one full carboy and then move on the next, minimizing siphon transfers. I also tried to minimize how long a carboy receiving a blend was half full. Once I had a racking plan and my blends figured out, all I had to do was wait until I had enough empty carboys of the right size, a good amount of empty bottles, and enough time to do this sort of thing. In early April that all came together and it was time to blend. The master table for blend ratios, volumes, and siphon order. As is probably apparent from the notes up until this point, I put a lot of thought into setting this up. I made myself a clear flow chart to follow on blending day. I labeled every carboy with it's blend numebrs and the proportion of each blend going in. The blend ratios were pretty simple so generally I didn't have to worry too much about putting volume markings on the side to tell me how much to transfer. One of the blends was going onto raspberries (8lbs/3.6 kg of frozen raspberries for a 5 gal/19 L carboy) so for this I marked out volumes, taking into account what the raspberries were already taking up. The other tricky part was going to carbonating the beer, and this was probably one of my most poorly done parts. I had planned to add priming sugar and bottling yeast into bottles by pipet because I didn't want to prime each whole batch as I didn't know what I would be able to bottle that night after the blending. I decided to re-yeast with RC-212 and, assuming 20 billion cells/g, I calculated how much water I would need to rehydrate that in to yield convenient transfer volumes (I have a 0.5 mL lab pipet) to yield 1 million cells / mL for 375 mL and 750 mL bottles (it ended up being one 5 g yeast pack into ~175 mL for a 0.5 mL yeast spike into 375 mL and 1 mL yeast spike into 750 mL). I rehydrated the yeast in a sanitized mason jar. That part worked out well, but the priming sugar was a bit trickier. I was also planning on mixing this in a sanitized mason jar by weighing the sugar out and pouring the measured amount of boiling water in to dissolve it. I calculated the same sort of thing, how much sugar for the carbonation I wanted based on the bottle size. And it ended up being a pretty concentrated solution that I needed to produce. Well, I decided to make it a bit less concentrated and just pipet more, but I neglected to account for the volume that the sugar took up and my final volume was about double what my added water volume was. This further increased my necessary priming spike size, which ended up being something like 12*0.5 mL spikes for 375 mL bottles and 24*0.5 mL spikes for 750 mL bottles. This is still an appropriately small volume given my total bottle size and fortunately I wasn't planning on bottling much while doing the racking, but it was a real pain to pipet out. So form this I've learned that the mason jar idea was pretty good and that will work out well next time as long as I have the ability to easily transfer volumes of roughly 10 mL for the sugar. Once all my bottles and carboys were sanitized, CO2 purged, and pre-labeled it was pretty straightforward and I was able to go through the blending pretty smoothly. I left my bottle filling tip on my hose the whole time, which made it easy to start and stop flows, and I sanitized further up the outside of the siphon hose and handled it with sanitized gloves to avoid getting my hands into the beer. I started my siphon full of sanitizer, using the sanitizer to start flow (as I always do) and ran that sanitizer into an extra bottle (which I later dumped out) until I got to the beer. I racked each beer until I just started to draw air and then swapped the siphon to the next carboy, allowing me to start the siphon for the next beer with the beer in the line from the previous carboy. This was great and I didn't need to re-start any siphons mid-process. I ran that bit of air into a miscellaneous bottle to avoid putting it through the partially full carboys. By the end of the process I had one mystery blend bottle and a full glass of mystery blend from this technique and the siphoning was super easy. The flow was slow enough to allow me to comfortable re-arrange things as I was going, moving full carboys out and the next empty ones in mid-process. The blending - siphoning beer 1. It took a lot of setup but all that planning made everything run pretty smoothly. I was able to continue to use the re-hydrated yeast to bottle the future blends (I transferred by weight knowing that I had 100 billion cells in 175 mL and that the weight of yeast was insignificant compared to the water, so there were ~570 million cells/g) and for future blends I was able to re-yeast and prime full carboys, which was much easier. Get a larger transfer pipet to prime each bottle (I still think priming each bottle is a good idea when bottling only one gallon from a 5 or 6 gallon carboy and blending the rest). Don't use oak rods/dowels/whatever in stoppers for aging. The beer can be great without it and it probably doesn't help. If it can help, the risk (both ruining the beer or a dangerous pressure build up) is not worth it in my opinion. Maybe have a second set of hands around next time. Both for the trial blending for a second opinion and for the actual blending. Though overall it worked quite well and, as you can see from the pictures, there wasn't much room left in the kitchen for me, let alone someone else, with all the carboys and bottles in place. I think letting these beers go as long as I did was a good idea. Maybe I could have done this a bit earlier and the beers would have been about the same, but I didn't notice any problems/bad flavors from going this long and they are definitely way better than they were at ~7 or so months old (the age of the oldest beers when they went off to Mark's basement). I think if you are really trying to approach lambic-like complexity then patience is key. And heading off for 8 months was a great way for me to let these beers sit long enough to develop some of the complexity I was looking for. I'll close this out with some extra pictures from my blending and will update as I think of more. Please ask questions about parts of my process if you have them. It may prompt me to remember stuff that I've forgotten and may give me some good ideas for next time. great write-up. Were most of the beers racked off the primary yeast cake? I have about 7x 6gal carboys all on the primary cake but not sure I want to rack them due to oxygen pick up. Thanks! Nice, sounds like you have some future blending coming up. Sorry it took me a it to respond to this. Most of these were not racked off of the primary yeast cake. One of them was but when I did that I racked it in the first few months so it was still active but after the main primary was done. I did this to downsize carboys in order to minimize headspace rather than prevent too much yeast cake contact time and I didn't notice any ill effects from leaving the others on the cake. Generally I think reasons such as other microbes processing autolysis products are given for the yeast cake contact time not being a problem, and some might say it is beneficial to leave the beer in contact wit the yeast. Whatever the case, leaving it on the cake was fine for me for about 2 years but I also didn't notice racking off to be a problem and there was still plenty of cake material in the racked carboys. The blending took place from the settled carboys and I didn't rack off at blending time into something else before doing the blending. I was careful not to stir anything up and after about 2 years the cake was pretty tight and not very fluffy so it didn't get disturbed easily. Thanks for the write-up, I was curious how this process falls together.